The visit of German Chancellor Angela Merkel (Christian Democratic Union, CDU) to Budapest this week was aimed at bringing the Hungarian government of Viktor Orban into line on foreign policy and stopping its orientation towards Russia. At the same time, the German chancellor also spoke unusually forcefully against supplying weapons to Ukraine. The Hungarian prime minister has to date criticised Western sanctions against Russia. They had not had their intended impact and would “harm us more than Russia.” Orban noted Hungary’s proximity to Ukraine, where the Western powers, led by Washington and Berlin, organised a coup with the support of fascist forces to overthrow the pro-Russian government, as well as the country’s dependence on Russian energy supplies. 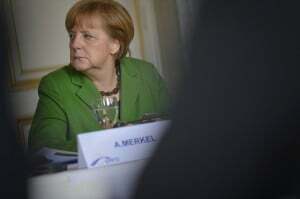 He told Merkel that he does not support any solution that will deepen the conflict. Russian President Vladimir Putin is expected in Budapest in two weeks. Merkel clearly is opposed to an escalation of the military conflict in Ukraine, at least for the time being, and is instead attempting to put Russia under pressure economically. At a discussion forum with students in Budapest, Merkel said it was important in the future for the 28 EU states to have a larger number of energy suppliers. Hungarian magazine HVG commented that Merkel and Putin were visiting Hungary because it is the soft spot of the EU. While Merkel wanted “to reestablish unity within the European community,” Moscow was following “the principle of divide and rule.” Merkel wanted to immunise Orban against the incentives offered by Putin. Economic interests play a central role. Orban acknowledged Hungary’s dependence on the EU, even though he often makes nationalist and populist speeches against Brussels. German businesses had created 300,000 jobs in Hungary. Last year, Hungarian exports to Germany rose to a new record of €21 billion. “I can only say to Mrs. chancellor: thank you Germany,” said Orban. At the same time, economic ties to Russia are pronounced. Orban’s Fidesz government approved the South Stream pipeline last autumn, which has subsequently been shelved. The pipeline through Hungary would have given Russia a central role in supplying energy to Europe while bypassing Ukraine. The decision was criticised in Brussels because it contradicted the EU’s policy. Hungary also agreed to a €10 billion deal with Russia to expand the nuclear power station at Haks. Shortly after the agreement, Hungary stopped supplying gas to Ukraine. Along with Germany, the US is also applying pressure on Hungary. In October, the US imposed a travel ban on six people, including leading state officials. The official justification is that they are suspected of corruption. According to reports in the Hungarian press, Ildiko Vida, among others, has been affected. She is the director of the tax authority NAF and joint founder of the governing Fidesz party. She is accused, along with other high-ranking politicians and officials, of having offered tax cuts to American businesses in exchange for bribes. Several opposition politicians in Hungary had appealed to Merkel to apply economic pressure on Orban. Most investments in Hungary are paid for with money from Brussels. The country obtains around €4 billion from EU sources each year. The Social Democratic and Liberal opposition in Hungary hoped through Merkel’s visit to secure her support. They organised and participated in anti-government rallies. The chancellor ought to indicate to Orban “that there is no place for him in the community of democratic European politicians,” a leading politician told a rally of the social democratic MSZP. Only a few hundred people came to the demonstration, overwhelmingly members of the opposition parties. Although tens of thousands demonstrated against the Orban government late last year, there were few illusions in the pro-EU protests held to coincide with Merkel’s visit. The social decline over recent years is not only blamed on the right-wing government, but also Berlin, which has forced Budapest to impose ever deeper austerity measures. According to a recent poll by Ipsos, only 23 percent of Hungarians would vote for Fidesz. Last November it was still 37 percent. Second place was occupied by the neo-fascist Jobbik party with 14 percent, and only then the MSZP with 11 percent. In a hypocritical manner, Merkel repeatedly praised the importance of press freedom and freedom of opinion. Orban has governed in Hungary for five years with a clear two-thirds majority. Fidesz has practically eliminated press freedom, with critical journalists being silenced. The establishment of a police state has gone hand in hand with brutal social cuts. Orban’s government has adopted several laws that explicitly target refugees, foreigners and the homeless. The long-term unemployed are forced to work in order to maintain any claim to social support. The elimination of press freedom and the building up of the state are taking place in direct preparation for deeper social attacks. Fidesz’s parliamentary fraction leader Antal Rogan intends to present an “action plan for the protection of the nation” this week. In this, critical NGOs are to be branded as foreign agents and banned as a result. These policies have been explicitly supported thus far in Berlin and Brussels. Orban’s Fidesz, like Merkel’s CDU, is affiliated to the European People’s Party faction in the European Parliament and despite all of the superficial criticism of Orban’s government, there has not been a single effort made to exclude Fidesz from the grouping.